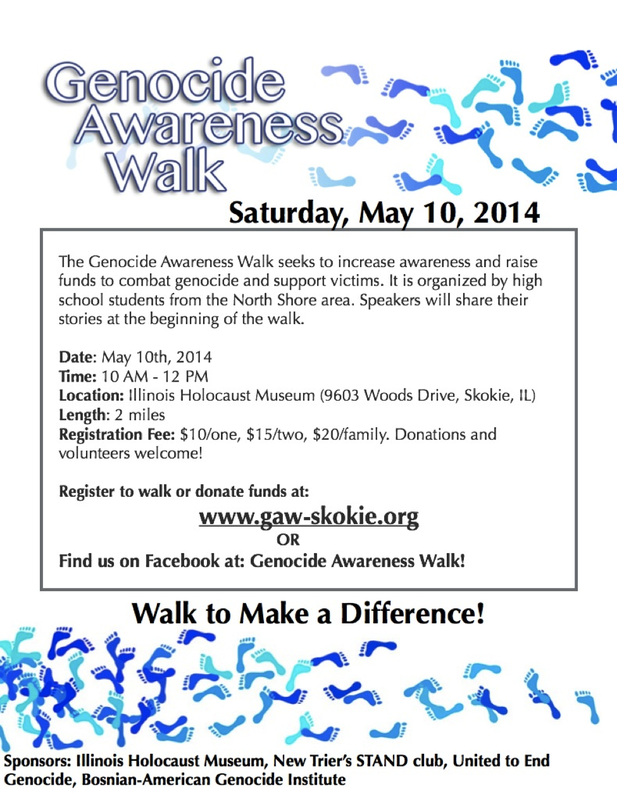 Date: Thursday, April 18, 2013 to Monday, April 22, 2013, from 8:30 a.m. to 3:30 p.m.
T7-8 grade teachers guide students through ten unique activities to bring the stories of children from the genocide to life. Students read primary documents, studied maps, listened to songs, read firsthand accounts, and examined photos from the Bosnian Genocide. Students recorded their observations and connections in letters and pictures. (To see more, click here to watch video). 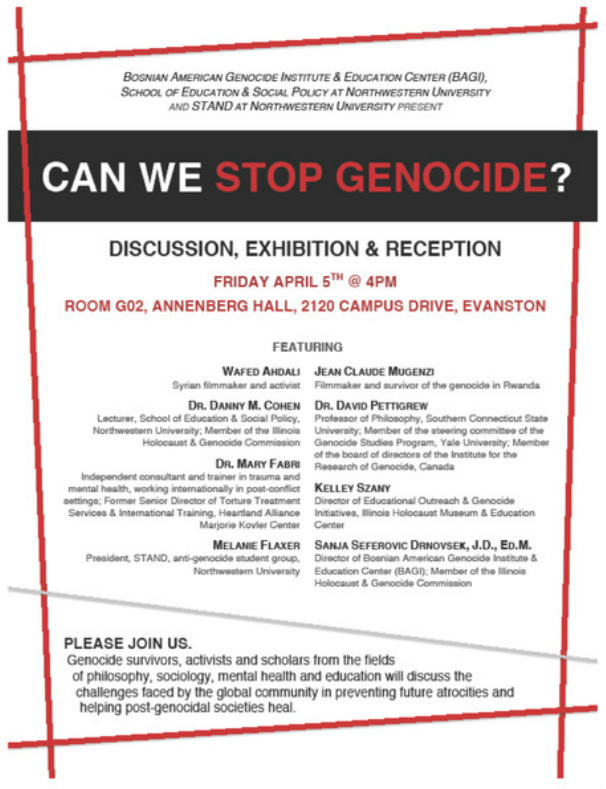 Date: Friday, April 5th at 4 p.m.
challenges faced by the global community in preventing future atrocities and helping post-genocidal societies heal. Want to check out how the event went? Click here to see a video. (To learn more, please download attached flyer). A valuable lesson in sensitivity! Teachers guide students through ten unique activities to bring the stories of children from the genocide to life. Students read primary documents, studied maps, listened to songs, read firsthand accounts, and examined photos from the Bosnian Genocide. Students recorded their observations and connections in letters and pictures. Presented by the Illinois Holocaust Museum and Education Center in partnership with the Illinois Holocaust & Genocide Commission to mark the 68th anniversary of the liberation of Auschwitz, we present renowned activist and humanitarian Carl Wilkens. He will share the choice that he and his wife made that resulted in Carl being the only American to remain in Kigali throughout the 1994 Rwandan Genocide. Book signing will follow the program. 9:00 p.m. to 10:30 p.m. The BAGI Exhibition: „ Traveling Memorials: Crimes Against Children During Agression Against Bosnia and Hercegovinia and Genocide Against Bosniaks 1992-1995, Author: Sanja Seferovic Drnovsek. Children’s poems, essays, dairies, and drawings from the war represent one of the strongest testimonies about genocide and other crimes in Bosnia and Herzegovina, and children’s strong spirit. (To learn more, please download attachment). The “Traveling Memorials”, are dedicated to the children of Sarajevo, Srebrenica and Bosanska Krajina; include the pictures and information about their life and death. (To learn more, please download attachments). One of the most important ways to remember the genocide in Srebrenica and all of Bosnia from 1992 to 1995 is to commemorate the atrocities every July 11, and to pay deepest tribute to the innocent lives who were victims of genocide. Monday, June 4, 2011, 10 a.m to 3:30 p.m.
Two Hundred Aspira Haugan Middle School students attended the exhibition. Ms. Drnovsek, Ms. Gross, Ms. Seferovic, and Ms. Felton guided students through ten unique activities to bring the stories of children from the genocide to life. Students read primary documents, studied maps, listened to songs, read firsthand accounts, and examined photos from the Bosnian Genocide. Students recorded their observations and connections in letters and pictures. The exhibition taught everyone in attendance—both student and teacher—a valuable lesson in sensitivity. "Political & Military Relevance of the Defense of Sarajevo 1992-1995"
In partnership with the Illinois Holocaust & Genocide Commission, the Museum presents two leaders in the field of memorialization, James Young and Cliff Chanin. Young, Professor of English and Judaic Studies at the University of Massachusetts, Amherst, served as a World Trade Center Site Memorial jury member. Chanin, the curator of IHMEC’s Legacy of Absence Gallery, is 9/11 Memorial Museum Education Director.Reservations required: 847-967-4889. On January 27 each year, the United Nations (UN) remembers the Holocaust that affected many people of Jewish origin during World War II. We commemorate the millions of victims of Nazi persecution. The day also commemorates when the Soviet troops liberated the Nazi concentration and death camp Auschwitz-Birkenau in Poland on January 27, 1945. It is hoped that through remembering these events, people will remember the Holocaust and prevent genocide. This paper is intended to give contribution to the celebration of the 25th November – Day of Bosnia and Herzegovina statehood and, in this regard, it represents the objective scientific findings related to the history of Bosnia and Herzegovina, which confirms that Bosnia and Herzegovina is a permanent political, social, and historic category. Within the framework of the selected topic and the space, we shall present four major issues – social and scientific findings, such as: ZAVNOBiH (Anti-fascistic Council of the National Defense of Bosnia and Herzegovina) and its historic relevance, Communists and the issue of Bosniac ethnicity, Restoration and the escalation of the Great Serbian movement, and Planning of crimes and defense of Bosnia and Herzegovina.